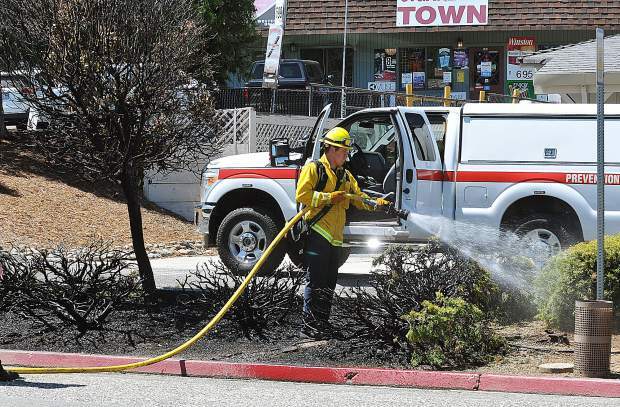 Grass Valley firefighters douse a small vegetation fire that started in a patch of landscaping in front of a business on Joerschke at Mailman Drive Friday morning. The cause of the fire was undetermined at the time. Above average temperatures, dry conditions, and breezy winds have prompted another Red Flag warning for wildfire danger in most of Northern California, including western Nevada County, Friday through Sunday morning. On Friday, Grass Valley firefighters were busy on the 100 block of Joerschke Drive at Maltman Drive, where a small vegetation fire broke out in a patch of roadside landscaping. The fire singed a row of mailboxes and charred a nearby utility pole before firefighters could put it out. AT&T was notified to assess any damage that might have been done to the lines. The cause of the fire was undetermined at the time. The small fire is one of a handful of local conflagrations that have kept area crews busy in the past week. On Tuesday, a vegetation fire on Greenhorn Rd and Call of The Wild Lane was kept to a few acres, a utility pole caught fire on Lower Grass Valley Road in Nevada City, and weedeating activities caused a quarter-acre vegetation and fence fire in Chicago Park. Cal Fire advises that any weedeating or motor powered gardening devices be used before 10 a.m.